(Nowhere People, 2012)Though ostensibly a photo book, Exiled to Nowhere serves as a vivid collection of reportage that few magazines could (or, these days, would) deliver. Photojournalist Greg Constantine takes us to the Burma-Bangladesh border, where tens of thousands of Rohingya refugees live in crowded, dirty camps. 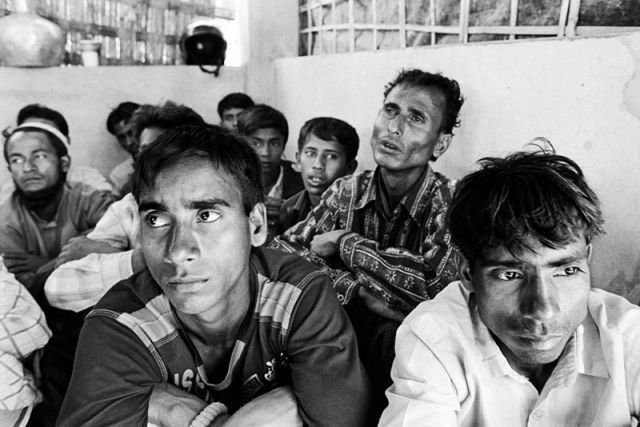 A minority long prosecuted by the Burmese government, the Rohingya live in a state of perpetual fear and uncertainty. 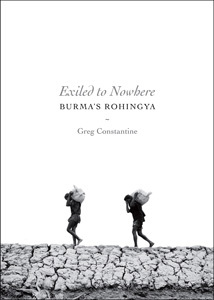 Their pervasive sense of living essentially “nowhere” is what Constantine successfully captures in his latest book. Whereas Saiful Huq Omi’s powerful photographic work for the Magnum Foundation traces the wider diaspora of the Rohingya living in England, Malaysia, and Bangladesh, Constantine’s book focuses primarily on the tense border region inhabited by tens of thousands of Rohingya. Shot in stark black and white, Constantine’s photos subvert any romantic notions of what it’s like to be a working documentary photographer, instead evoking the patience and commitment required. Constantine shot the series over the course of eight different trips, between 2006 and 2012. A group of Rohingya men are detained at a highway checkpoint in southern Bangladesh. 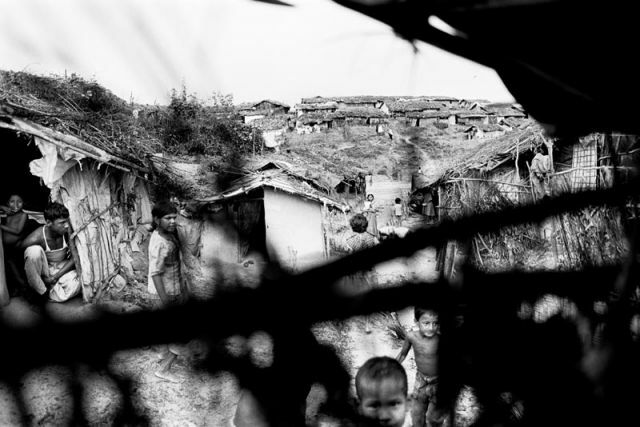 The 92 photos in the book detail life in various refugee camps, showing the monotony and struggles of daily life. They give a sense of who these people are: In the different camps, among the different families, a repetition of a muddy, difficult, yet somehow self-sure existence emerges. Over the last 20 years, legions of Rohingya have fled their homeland and now live as unrecognized refugees in neighboring Bangladesh. Some 20,000 live in the squalid environs known as Kutupalong Makeshift camp. The book’s accompanying interviews and text provide important context: Reading about how Thai authorities pushed boats full of Bangladeshi and Rohingya refugees out to sea—many of them to their deaths—or about how others were threatened and viciously beaten in Burma, adds that much more impact to the photos. A woman and her grandchild sit on the side of the road at the Tal Makeshift Camp near the town of Teknaf. 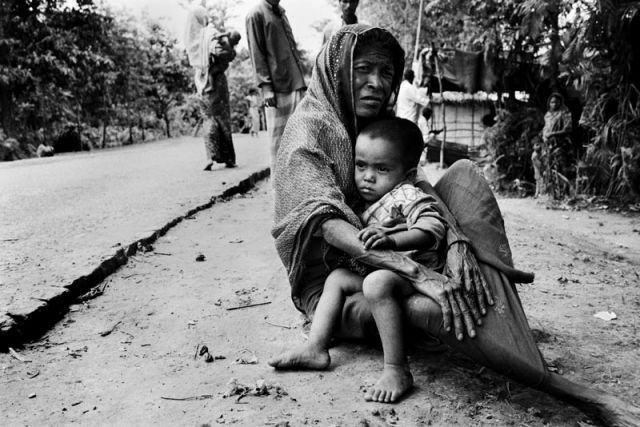 Most Rohingya in southern Bangladesh are not recognized as refugees and receive little or no humanitarian assistance. The bar is high when it comes to grabbing the attention of readers (and photo editors) with projects focused on human rights in desolate places. It’s refreshing to get yanked out of that jaded place by a successful project like Constantine’s. 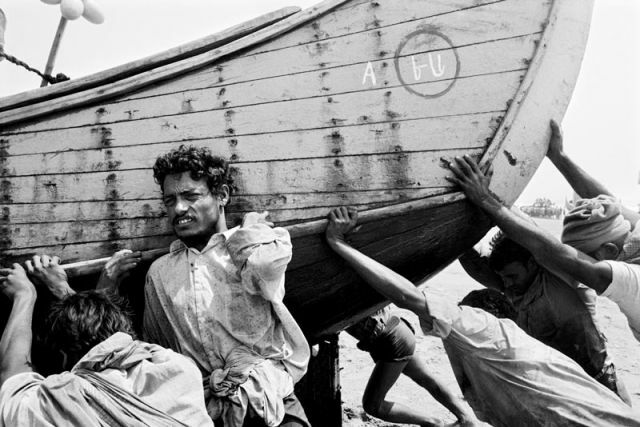 A group of Rohingya men push their fishing boat back onto shore. Most Rohingya men in the Shamlapur region of Bangladesh work as bonded laborers and are trapped in debt to local Bangladeshi boat owners. Exiled to Nowhere is the second book in a longer term project called Nowhere People, a documentation of stateless people around the world in places including Sri Lanka, Nepal, Malaysia, Ukraine, and Bangladesh. (Constantine’s first book, Kenya’s Nubians: Then & Now, was published in November 2011.) It’s an ambitious undertaking, and perhaps one that only a thoroughly committed photographer like Constantine could pull off. Wanna Increase Your Burma Awareness?